When we bought Pintail she was in Gosport. The prospect of a three hour drive and exhorbitant marina fees meant we needed to move her. After a quick shakedown cruise in the Solent under the guidance of our sailing mentors Jane and Martin we planned the 3 day trip up to Essex Marina and roped in our delivery crew – Clive, Carolyn and Mark. We spent our first night in Newhaven, accompanied by the noise of the scrap metal barge. It looked much prettier at dawn than it sounded. 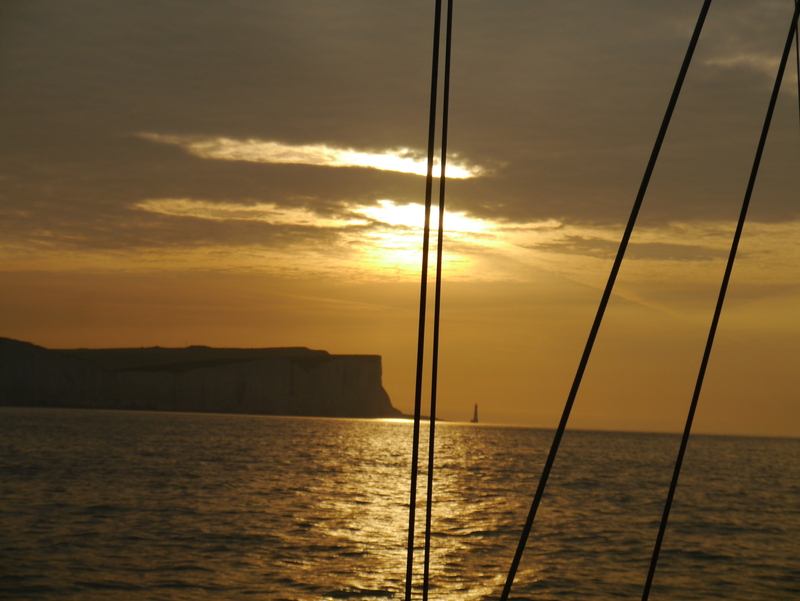 An early start to catch the tide from Newhaven meant we got to see the sunrise over Beachy Head and I got to sail passed the Seven Sisters, one of my favourite places in the world. After a short night in Ramsgate (arriving too late and leaving too early to pay!) we headed up into the Thames Estuary and our first experience of negotiating WW2 forts and sandbanks. Our embryonic navigation skills did not quite calculate the tides well enough to avoid a long slow passage down the Crouch to Pintail’s new home. But we made it and there was champagne! Some of my very fondest memories are of trips spent on Pintail with my parents, Jackie and Bryan Pinder, my husband Fernando, and our children Guille & Sofia. Salcombe, the Channel Islands, Morocco, the Balearics, Portugal. It really makes us very happy to see her in such good shape! Happy sailing! Fiona, we were so excited to hear from you and about Pintail’s past adventures. It was obvious to us when we bought her that she had been much loved and brilliantly looked after. We’ll be heading back to some of those playgrounds when we set off for the Med in June this year. Thank you for getting in touch and keep up to date with her new adventures here! Hi! I live in Mallorca so it would be great to meet up if you get this far.